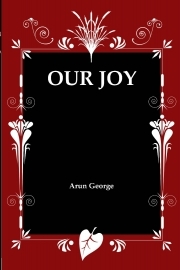 Our Joy is about a teenager, Aaron, who has his first crush on a girl from his school. He has a month till school starts again and is determined to win her over in that time, because when school starts, there will be cut-throat competition for her heart with the new admissions coming in. But, what starts out as harmless flirting over the Internet soon turns to a dangerous game that could make or break his future, when he meets a strange man who knows more about him than he does. When he says that Joy is the Key to everything, everything goes awry. Who is this man and what secrets does he hold? Will love survive or will it wither in the heat of an all out war between hormones and emotions? To find out, read 'Our Joy'. Arun George was born on 14th July 1995. He is from the Thrissur district in Kerala. His passions include reading, creative writing, movies and cricket. He constantly attributes his love for the English language to the thousands of hours he spent watching television and the few hundred hours of reading. He names J.K. Rowling as his key inspiration to write. An avid fan of the psychological thriller genre, Arun forayed into the world of writing through short stories. From the strong base of a supportive family and encouraging school environment, he gained confidence in his writing. His first novel, 'Our Joy', was written as a part of the National Novel Writing Month November (NaNoWriMo). He currently resides in Bangalore, Karnataka, pursuing a Bachelor of Arts degree in Communication, English and Psychology at Christ University.